Thanks to John Lee, who was part of the superb technical crew that worked on the movie, I’ve learned that “Toxic Zombies,” a.k.a. “Bloodeaters,” a.k.a. “Forest of Fear,” a.k.a. Il ritorno degli zombi,, in which I play a small part, is one of 2,700 movies on VHS tape acquired by Yale’s Sterling Memorial Library, according to this Yale Daily News story. The story mentions “Toxic Zombies” at the outset, evidently because of its gory title–also mentioned are “Silent Night, Deadly Night” and “Buried Alive”–but without mention (until my comment below the story) that its writer, producer, director, and star was a Yale Law School alumnus, my late friend (he was in his office on the 100th floor of One World Trade Center on the morning of September 11, 2001) Charlie McCrann. You can read more about the making of “Toxic Zombies,” and find links to a trailer and some reviews, here. Coney Island Brewing’s "1609 Amber Ale." Coney Island Brewing Company’s “1609 Amber Ale” takes its name from the year Europeans first set foot on what we now know as Coney Island. I paired it with a “Smokin’ Henry” (smoked turkey, Black Forest ham, smoked Cheddar, bacon, lettuce, tomato, and Russian dressing) from Lassen & Hennigs. Head: moderate, stood up well. Aroma: banana and peach, with a toasty malt undertone. Flavor: good balance of fruit and malt flavors, with a hop finish that’s satisfying but not overwhelming. Technical details (from the brewery’s website): There are five kinds of malt used. Along with the usual two row barley, there are carapils and caramunich, melanoidin, and chocolate malt. The hops are Cascade, Amarillo, Tettnang, and Northern Brewer. ABV is a moderate 4.8%. This is a well made, satisfying ale that complemented a tasty sandwich but could be enjoyed by itself. The flavor is complex but well balanced. When I was in Mrs. Blalock’s 12th grade English class at Robinson High School in Tampa, I was required to give a book report every six weeks. Mrs. Blalock said students must begin each report by saying why they had read the book. With a tip of the hat to my still loved though long deceased teacher, I’ll begin this with a disclosure: I read this novel in part because the author is the daughter of a friend, neighbor, and fellow Grace Church parishioner. “In part” because another reason for my reading it is that it’s set in the neighborhood I’ve called home for the last almost 32 years, Brooklyn Heights, though at a time long before I came here; indeed partly before I was born. As VJ day draws to a close, Loretta and Wally arrive at Stella’s apartment a little later than planned; there they find Stella dead on the kitchen floor, a suicide. Life, both natural, in the form of ants, and imaginary, in the guise of Wonder Woman, pervades the narrative of Wally’s growth and maturation. Ham becomes interested in the ant colonies he found in Waldo’s and Gigi’s back yard, and collects some to form a captive colony inside a fish tank. He communicates his enthusiasm to Wally, who does the same. Gigi takes them to the Museum of Natural History and introduces them to Vernon Somersby, an entomology curator. Somersby is impressed and offers them regular tutelage. He gets Wally onto a team of researchers who are studying how ants communicate, and she makes an important discovery. Communication, or the lack of it, is the major theme of the novel. Wally regards Stella, who is reticent about her life away from Wally, as a mystery. Bill Niederman is a mysterious figure, engaged in secret war work. A failure of communication between him and Stella, once rectified, sets the action going. Ham is infuriated by Loretta’s late disclosure of his true parentage. Wally is grateful for RADAR (always in all caps), a form of communication of which the initial recipient is unaware but which reveals the recipient’s location to the sender, for keeping her father alive in the war. There’s even a discussion, by Bill Niederman after he returns to teaching math at Rutgers, of the “Traveling Salesman Problem,” which has to do with establishing the most efficient routes of travel or communication. a matching dress, short with a sequined bodice and more of those spangly silver daggers on a blue field. Under the dress lay a blue and silver headband and a pair of silver high-heeled booties. It was the costume Wally would have conceived for her mother, if her mother was a superhero. Worlds opened up in Wally’s mind like accordion folds. Long-standing conundrums sorted themselves out…. All those days and nights she was away, too busy for Wally–she’d been striving to make the world safe for her daughter. And the sense of withholding that Wally had sometimes felt, the sense that her mother was keeping something from her, all that made sense now, too….She was Stella Wallace Baker by the light of day, and the Silver Wonder, a shining streak of justice, by night. My fellow Brooklyn Heights residents will find some interesting history here. Jim Crow was not absent from our neighborhood, as we see when Wally and Ham go to swim in the St. George Hotel’s Olympic size poll, and the woman at the entrance directs Ham to the “colored changing area.” Ham endures a severe beating when he and Wally go down to the still active docks below the Heights and a longshoreman takes offense at his being there with a white girl. 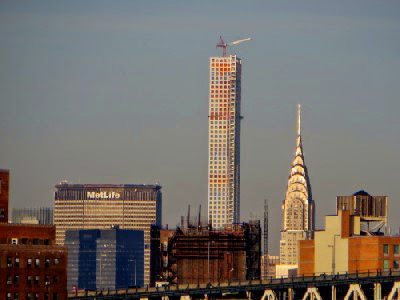 Finally, we get to see what it was like for those living on Columbia Heights–including Waldo and Gigi–when Robert Moses’ “Brooklyn and Queens Connecting Highway” (now the BQE) takes away a large chunk of their back yards. When the World Was Young is published by Random House, New York (2014). TBT: Neil Sedaka, "Stairway to Heaven"
Long before there was Led Zeppelin, even before there were Yardbirds, there was Neil Sedaka. Brooklyn born and raised (his father was a cab driver) and trained to play classical piano in Julliard’s preparatory school program, Sedaka found his true love in pop music as a teenager. 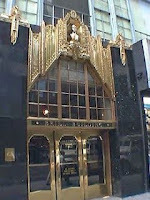 He and lyricist Howard Greenfield, a boyhood friend, became one of the songwriting teams–along with Gerry Goffin and Carole King, Jeff Barry and Ellie Greenwich, Jerry Leiber and Mike Stoller, Barry Mann and Cynthia Weil, and Doc Pomus and Mort Shuman–who had offices in the Brill Building, a 1931 vintage office building at Broadway and 49th Street with an elaborate art deco entrance (photo). Producers Don Kirshner, George “Shadow” Morton, and Phil Spector also had offices there. Sedaka, like Carole King, was a singer as well as a songwriter. His recording career began in 1957 with “Laura Lee” on the Decca label. His first song to chart was “The Diary,” on RCA, for which he continued to record through the remainder of the 1950s and ’60s. He cracked the top ten in 1959 with “Oh! Carol,” which made it to number nine. In the summer of 1960 “Stairway to Heaven,” which apart from its title bears no relationship to the later Led Zeppelin hit, also reached nine on the hit parade. I remember “Stairway” fondly because it was one of the songs that I heard many times on the car radio, along with Roy Orbison’s enthralling “Only the Lonely,” the Hollywood Argyles’ hilarious “Alley Oop,” and Ray Peterson’s bathetic “Tell Laura I Love Her,” when my parents and I went from Tampa to visit my mother’s relatives in Pennsylvania and my father’s in Indiana during the summer between my eighth and ninth grade years. I always enjoyed these road trips, and music I heard on them got engraved on my memory. An intriguing feature of “Stairway” is the rising “Bwaaaaah!” sound at the end of each chorus. The musicians credited on the song include Irving Faberman on timpani; this sound is likely produced by pedaling the drum. There’s also a sax bridge by the then almost ubiquitous King Curtis. Sedaka continued to have hits for RCA through 1961 and ’62, when he reached the top of the chart with “Breaking Up Is Hard to Do.” His slow ballad version of that song, released on the Rocket label, reached number eight in 1975, but topped the “easy listening” chart, giving Sedaka the distinction of being the only artist to have topped charts twice with different versions of the same song. Neil Sedaka will celebrate his 76th birthday tomorrow, March 13, 2015. 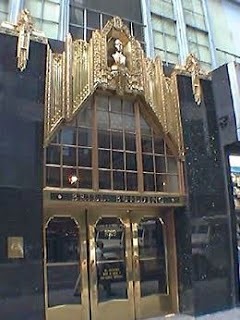 Brill Building photo: San Francisco Public Library. Coney Island Brewing’s new "Overpass IPA" compared to its "Seas the Day" IPL. Coney Island Brewing Company recently released a new brew, Overpass IPA. Why “Overpass” and why the elephant on the label? The overpass in question is the Brooklyn side overpass of the Manhattan Bridge as it descends toward earth a ways inland, and the elephant is because the artists who years ago settled into lofts in the formerly industrial neighborhood beneath and around this overpass called it “DUMBO” for “Down Under the Manhattan Bridge Overpass.” Alas, those artists, other than those who became successful enough to pay ever increasing rents or to buy, have since been banished, as New York’s Bohemia is forced farther and farther afield by the inexorble workings of the real estate market. Last year Coney Island Brewing released “Seas the Day India Pale Lager,” which I tasted and reviewed. Having gotten Overpass, their first India Pale Ale, I couldn’t resist sampling them side by side (see photo above). The first thing that struck me is that, contrary to my expectation, the lager (on the left) is a deeper amber color than the IPA. Please don’t conclude from the photo that the lager produces a much more ample head. Before I poured the brews, I accidentally knocked over the lager bottle, which made it very fizzy. The IPA produced a full, foamy head which had largely collapsed by the time that on the lager had declined to the point where I could finish pouring it. As I did when I reviewed Seas the Day, I paired both brews with a spicy Vietnamese bánh mì sandwich from Hanco’s. Before this tasting, I tried the Overpass IPA by itself. My notes were: aroma–hops predominate, with floral undertones; flavor: hop bitterness dominant throughout. When I gave my wife a sip, though, her reaction was “Malty!” As the ale warmed in the glass, I got more malt flavor. For this tasting I let both brews sit on the table for a while so that, when I poured, they were not too far below room temperature. This time I noticed malt flavor at the start in both brews, although the hop bitterness seemed more pronounced at the finish in the lager than in the ale. As it got warmer, the IPA seemed almost toasty. But as I ate the spicy sandwich, I noticed the hop flavor in the ale becoming more pronounced again. The principal difference between the IPA and the IPL was that the latter had more pronounced fruit overtones. This seems odd given that the hop mixture in the IPA includes two varieties–Centennial and Nelson-Sauvin, that are not used in the lager and are said to impart fruit flavors. I find the Overpass IPA a fine, well crafted example of the style; one that, if not served too chilled, has excellent hop-malt balance. Of the two, I think the Seas the Day IPL is more interesting; but why wouldn’t an unusual brew like an India Pale Lager be so? Coney Island Brewing has also recently released a 1609 Amber Ale, 1609 being the year Europeans first set foot on what is now Coney Island. I have a bottle, and will be reviewing it soon. The Mets are in camp; they’ve yet to play a spring training game. That comes Friday, against the Tigers. Signs are good: Matt Harvey can throw well following Tommy John surgery; David Wright is healthy (at least for now); everything else seems to be in good order. 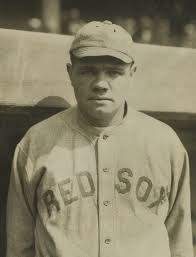 So, first, why do I have a photo of Babe Ruth, a Yankees hero, although I managed to find a 1916 shot of him in a Red Sox uniform? More about that below. Truth is, I got nervous when I read this New York Times story. Anything that indicates the Mets are doing something other than concentrating on playing baseball, especially if it smacks of premature triumphalism, puts me on edge. Sort of like Darryl Strawberry’s rap “Chocolate Strawberry.” recorded and released in 1987, just as the Mets were beginning their as yet interminable decline from their 1986 championship. And the Babe? Thinking about players’ publicity appearances brought to mind a story I read some years ago. It was 1942, and everything had to be about the War Effort. The Babe was to be interviewed on Grantland Rice’s radio show, so one of the questions was how sports could contribute to that effort. Rice had scripted an answer; “Well, Granny, as the Duke of Wellington said, the Battle of Waterloo was won on the playing fields of Eton.” This was rehearsed several times until it seemed Ruth had it down pat, but when the show went live, he said, “Well, Granny, as Duke Ellington said, the Battle of Waterloo was won on the playing fields of Elkton.” Asked afterward why the deviation from script, Ruth said he didn’t know Wellington but did know Ellington, and while he’d never been to Eton, he married his first wife in Elkton, and would never forget that place. Update: already the intra-squad sniping has begun. Like last week’s TBT, this is a memory from my law school years; this one from the spring of 1968, when I was a first year law student and, as a transplant from Florida to Massachusetts, experiencing my first real spring since I was a child. I had spring fever bad, which wasn’t helping me concentrate on my studies. Many nights I stayed up late, trying to catch up on assignments and prepare for exams, and would always have WBCN, Boston’s first “underground” FM rock station, playing. Despite “Candymen” and “Rodney Justo” sticking in my memory, I didn’t follow them at the time. WBCN didn’t play the song again, at least not when I was listening, and no Candymen albums showed up in the record bins at the Harvard Coop. My principal musical interests at the time were the harder edged British Invasion groups–the Stones, the Who, the Yardbirds–along with Dylan and the country-tinged rock of the Byrds and Buffalo Springfield. From the last two I developed passions for, respectively, the “Cosmic American Music” of Gram Parsons and the protean Neil Young. After the Candymen, Justo became a founding member of Atlanta Rhythm Section; the photo at the top of this post is of him while he was with ARS. The video clip below is of a reunited ARS performing “Doraville” live sometime in the not-too-distant past; Justo is the lead singer. Some years ago Justo left the full time music world and took a job with a beverage distributor because he decided it was more important to be a successful father than a successful musician. Nevertheless, he still does gigs with Coo Coo Ca Choo, a ’60s-’70s revival band, in the Tampa area. Lesley Gore, who died today at 68, is most remembered for her first hit, “It’s My Party (and I’ll Cry If I Want To),” which began a successful collaboration with Quincy Jones as her producer. She was a Brooklyn native, but her family moved to New Jersey, where she attended the private Dwight School for Girls in Englewood. She was a sixteen year old junior at Dwight when Jones signed her to Mercury Records and she recorded “It’s My Party,” which went to the top of the Billboard pop chart in 1963. Her recording and performing career continued through high school and Sarah Lawrence College, where she studied drama and literature. She later did some acting; the photo above shows her as Catwoman’s sidekick Pussycat in the TV series Batman. My favorite of her early hits (she continued to record, perform, and write music through much of her later life; her last album, Ever Since, reviewed favorably in The New York Times, was released in 2005) is “You Don’t Own Me,” described as an “empowering, ahead-of-its-time feminist anthem” by Daniel Kreps in Rolling Stone. The video clip above shows her performing it as part of the T.A.M.I. Show in 1964, when she was eighteen. While “You Don’t Own Me” could be seen as an “answer song” to Joanie Sommers’ 1962 hit “Johnny Get Angry” (“I want a brave man; I want a caveman”), Gore didn’t see it that way, at least not when she recorded it. She thought of it as something a man could have as easily sung to a woman. Like all of Gore’s early songs, it wasn’t written by her. It was written by two men, John Madera and Dave White. Gore was in college when she first realized that she was a lesbian. She didn’t announce this to the public until 2005, when she was hosting In The Life, a PBS show about LGBT issues. Her death was announced by Lois Sasson, her partner of 33 years. While “You Don’t Own Me” was not an answer to any particular song, it responded to an entire era. The late 50s and early 60s were full of songs which instructed women on their role viz a viz men in society: not only “Johnny Get Angry”, which you mentioned, but also “Love and Marriage”, “Wives and Lovers”, and probably the most egregious of the lot, “Bobby’s Girl”. The fact that “You Don’t Own Me” was on the air was a grand signal that even if that era was not over, it would, in fact, soon be history. It also occurred to me that 1963, the year “You Don’t Own Me” was released, was also the year that Betty Friedan’s The Feminine Mystique was published. 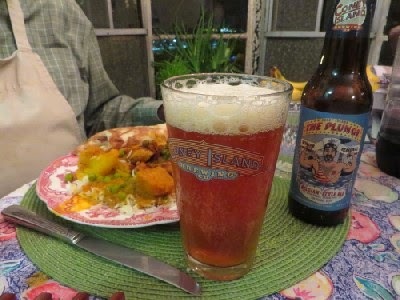 The Coney Island Brewing Company’s winter seasonal offering is called “The Plunge”, after the Polar Bear Club’s winter swims at Coney Island. With a name like that it should be, well, bracing. The label says “Belgian-Style Ale with Ginger, Orange Peel and Fennel Seed.” As I’ve mentioned before, I’m leery of brews with additives. To riff on The Lovin’ Spoonful, “All I want is malt, yeast, water, and hops just to set my soul on fire.” Still, despite initial strong doubts, I liked Coney’s summer brew, Tunnel of Love Watermelon Wheat. I found their autumn offering, Freaktoberfest, less pleasing. Pumpkin is not one of my favorite flavors, although the espresso beans added an interesting note. Color: vivid amber (see photo). Head: ample, but not over-the-top (ditto). Aroma: fruit and spices, hint of licorice (thanks to the fennel). Taste: a rich mix of fruit, spice, malt, and a muted hop finish, with a touch of licorice. As the meal progressed and the ale warmed in the glass, the fennel accent became more pronounced, and malt carried through to the finish. The Plunge went well with the spicy curry, its own spiciness complementing rather than amplifying or fighting that of the food. All in all, a pleasant drink, and one I’ll enjoy again. Would I compare it to a swim in frigid water? To me, it was more of a sitting in front of a fire on a winter’s night kind of beverage. At 6.9 percent ABV, it will warm you up. Technical details are here.